Hey Jeff! Yet another translation finished! 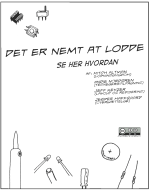 !, this time of the old single page comic to spanish. 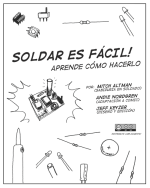 I have to tell you that I’ve passed the full spanish comic to my cousin, and today for his 14th birthday I gave him a toolbox-kit full of the basic tools for learning electronics and soldering. 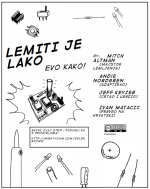 In no time he’ll be making his own electronics projects and in a big part because of your awesome comic. 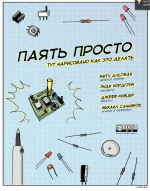 I also gave him a writer user on my blog, so I’ll encourage him to post his projects and progress in electronics. Hope you like it!, pass the word to mitch! Thank you for yet another excellent translation and your inspiring words!! Hi, I translated to Japanese. 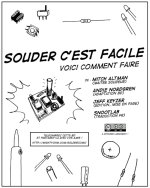 Thank you very much for translating the Solder Comic into Japanese! I will post this on the blog shortly! I’ll see what we can do about releasing the book in e-formats, thanks for the suggestion! Based on your comment I would say that your plans for the comic are totally ok and awesome! Im on page 5 with the german version. I have to say, that it’s harder than I expected. Not because of the actual translation but because of refitting the german text back into the comic. The issue is that german in length is about 1.75 to 2 times longer (meaning you need more letters and words to say the same). But therefore its amazingly more accurate than english. I also had to do some editing of my own. But only to the extent, that I added value information or clarified something that would otherwise sound like jibberish in a 1-to-1 translation from english. I never deducted anything from the orginal comic. 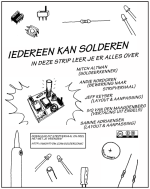 Example 1: The german word for “solder” already contains the implication that it is a metal! Thus the extra statement “which is a metal” would not make sense in german. So I added the information that it is a “composition of differnt metals” als clarification for those total newbies (especially children). Example 2: The word for the soldering pads on the PCB is depending on the Technology used. 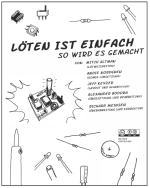 For THT it would be “Lötaugen” (=Soldereyes) and for SMT it would be “Lötflächen” (=Solderfields). Since the word “Pads” would not be sufficient enough of an explanation I took the liberty to translate it using both german terms and clarifiying its usage depending on the Technology used. German language is highly self-explanatory. It’s like LEGO (you have a limited amount of basic stones from which you can build endless things that reveal themselves). There are about 8000 independant words you just gotta know and everything else is dumbfoundedly a combination of these words. Therefore a lot of the explaining sentences necessary in the english language would be just dumb repetition of the before sentence if translated 1-to-1. I found myself in this situation so many times I just added more detailing information to fill the spacing in some places that are picture critical. In most other places, like said above, there was way less space than actually needed. Translating from german into english is rediculously easy compared to this, because it’s like translating from a detailed description to a generalization (i.e. : “oh that’s a cow sitting on a apple three” = “oh that’s an animal on a plant”). I hope Mitch, Andie and Jeff approves these alterations and neccesary changes. Otherwise I don’t know any other way of translating that would work! I already had to rephrase many sections to make them shorter so they’d fit into the boxes! I challenge anyone doing that without any informational loss – it’s not easy! But being a native english and german speaker makes the whole challenge a bit more easier. ESTIMATION: I’ll be done tonight – Upload tomorrow! P.S. : Anyone who wants to participate in my translation version, such as Nils Hitze is welcome to proof-read and edit-submit rephrases that either shorten the length while keep the actual informational content or additional clarification information in sections that allow such additions or even make them necessary. These will be added into a new version that will be submitted again to the site. So wait for me to upload mine tomorrow and then get to work and send me an email with the changes as well as your name. P.P.S. : Besides that feel free to work on and publish a alternating version – My translation ain’t the is-all, end-all! Btw: Mitch and Jeff you two have very typical german surnames. Keyzer = probably an english adaptation from the german word “Kaiser” which means Emperor or King-of-Kings in german. Originally a variation from the latin word ruling title which is pronounces in german “ZAETZAR”. Well this is bizarre. The shortlink works if you access it directly, but clicked here it redirects to the wrong place. I will have to hit the logs later but in the meantime, here is a proper hyperlink. I’ll post this tomorrow! Thanks again! Alrighty then Jeff, but just for the sake of it I’ve done another version that includes my name in the last page, and Hiperlinks to the sites of the three of you. I didn’t made this translation for recognition or anything but only because the comic really engaged me and stroke very deep on my geekyness. Anyways Here’s the new link. Feel free to post either one. 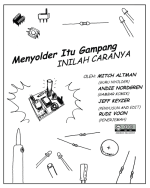 I’ve translated into Bahasa Indonesian! Posted! Thank you for translating! Announcement: Okay, I guess I’m volunteering to translate the book into german! Please do! We are desperately in need of a German translation! I’ve finished the Portuguese Brazil version! Xinchejian is also working on French version 😉 Stay tuned! Here’s the Simplified Chinese version, the prices for tools have been adapted with prices in Chinese yuan in China. Nice work! I’ll post it on the blog. Thank you! I’m already translating to portuguese Brazil! When I’m finished I’ll review and send to you!! Hello, looks like a terrific presentation….was soldering from a young age and want my little guys to know too, will this be in E-Book format? Thanks! Are you referring to the comic or the book? 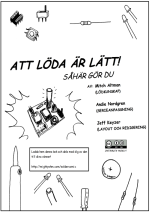 If you are looking for the comic in E-book format: I’m not familiar with what E-book formats are out there, can you give me an example or offer to do the conversion for us? Just found this on LifeHacker.com and saved to my archives, material like this makes it much easier for me to learn! Thank you! I’ll post a link to this in the original post shortly. Thanks. Clear, simple and thorough. 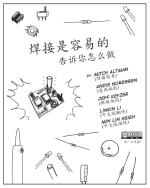 I’m from XinCheJian, a hackerspace in Shanghai. We’re working on Chinese version of this book, it should be finished in a few days, I’ll post the link ASAP. I was always taught to clean the soldering iron, then dab a tiny amount of solder onto it. This gives the iron a “liquid edge” which means it touches the pad and the lead with a greater surface, which ensures the heat is transferred (evenly and quickly). In truth, simple joints work either way, but more difficult ones benefit from this technique. Also, I was taught to look at the shape of the solder join when it’s cold. If the join has a sort of inverted curved pyramid shape around the lead, then it’s good (because the solder has properly wetted the joint), but if it’s sort of a blubous outwardly curved shape, then there’s a good chance the joint is dry (and although it may work now, it’ll probably fail in the future). Either way, this and the one-page version of it are great guides – thanks! I agree with (and practice) both of these things. A lot of times a good solder joint is described as a “hershey’s kiss” but we didn’t include that language because we figured it is only in common use in the United States. 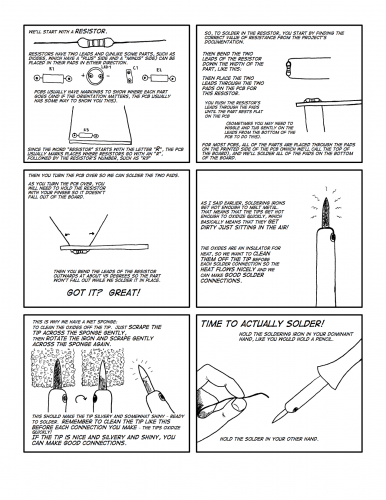 I just posted the Comic Life source file, maybe this will help?? Anyway, thank you for translating the comic, and when you finish, please post a comment so I can link to your translation! Hey Juani and Andres! I was going to put myself to work on the spanish translation too. Maybe we can collaborate on it so it doesn’t take that much. Also I have a lot of comic fonts to make it look exactly as the original and I can handle myself on the corel thingy. Anyways, please send me an e-mail, tweet or whatever. Hey guys! Listen, I had some time out this days, so I put myself to work and finished translating the whole comic. I don’t want this to be seen as a competition but a collaboration, so, if any of you have a correction or suggestion, please fell free to tell me so. Good work! Soldering really is easy! Awesome job guys. 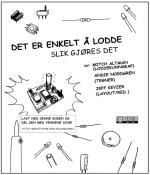 I’m also looking for a similar type of guide for getting started with electronics in general, any suggestions? 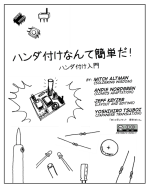 Word on the street is that No Starch Press is working on a Manga guide to Electronics… I would keep an eye out for that! 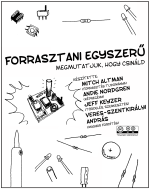 Our book will also include a chapter on basic electronics, but sadly it won’t be in comic book format. Thank you for your very kind words, we’re glad you like it! 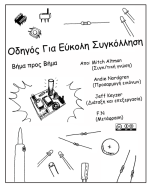 I am interested to make a Greek (Hellas) translation. Is there any instruction/guidelines? E.g. is there any LaTeX files? Or any other kind of “source code” we can use? 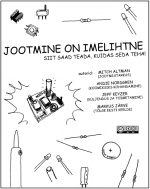 I think the approach that translators have taken in the past is to take the images without text (linked to in this post) and then use a tool like Photoshop or GIMP to add the translated text. The source files are in a program called Comic Life. I’ll see if I can make this file available if it would be useful to you. Great timing! 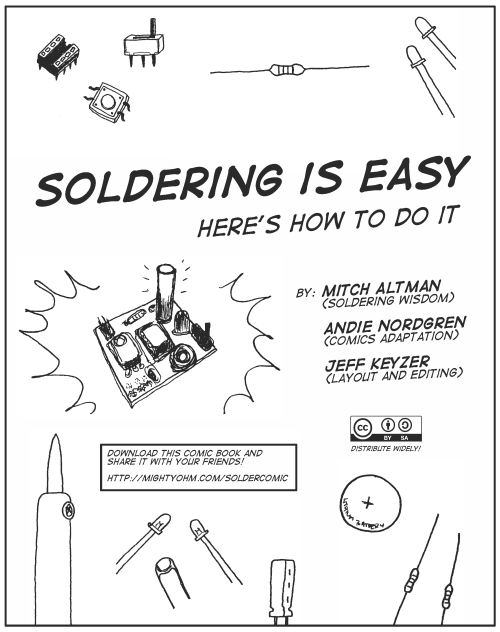 I am finishing an electric guitar build, and today is soldering day, whoch I do every two years or so, so always need a refresher..
this is sweet, and useful! Thanks Jeff! Great guide for budding “solders”! Thanks for the wonderful guide. 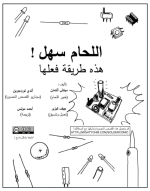 I just soldered my first circuit board before I found this guide and it was quite a mess. Needless to say my second time around was much better after reading this! Hi Jeff! This is a great job! 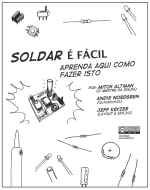 I’d like to translate this comic book to Brazilian portuguese, what do you think about that ? Could you send the name of the Font that you’ve used on it ? 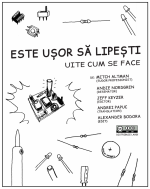 The font is DigitalStrip, included with Comic Life. I found this comic informative and helpful. One thing I would like to see is information and tips on how to attach objects to a board that don’t have leads to bend (e.g. ICs). They can be difficult to solder on when they won’t stay on the board! You can use short lengths of blue painter’s masking tape to hold components with short leads, It doesn’t take much tape to hold it securely, so a roll will last you quite awhile if all you use it for is soldering. If thats your concern perhaps you should invest in a solderless breadboard. its more useful for ICs anyway.